In the summer of 1974, I moved to Los Angeles from Roanoke, Virginia with my mother Judith and my little sister Lori. At age 11, I was quite upset that I’d be missing my close friends and family. One thing that helped me to cope was that I’d be moving to the fabled Golden State: sunny Southern California with its legendary swimming pools, palm trees and movie stars. Deeper still, my mother promised she would look into getting me into Jim Kelly’s renowned and respected Black Belt Jones Karate Studio on Crenshaw Blvd. That was something I could really sink my hope’s teeth into. We drove to the school on a bright Saturday afternoon and met with the head of Sensei Kelly’s instruction team: a warm and friendly fellow Virginian named “Holloway.” Mom and I both connected with him right away as we observed the dojo, practice equipment, posters of upcoming events and a couple of choice photos on the wall featuring Mr. Black Belt Jones himself. As I sat reading one of the informative articles on the wall, in walks The Man himself…Jim Kelly! He completely oozed charisma: the large perfectly shaped afro; a real cool and fitting Levi’s jeans jacket and pants; his famous shades; and his trademark pooka-shelled necklace. He had a natural swagger that others could only envy or just try to imitate. I was speechless. Mom: downright giddy. Holloway, who had probably witnessed this kind of star-struck response all the time, asked if we would like to meet him. “Oh, yes,” Mom exclaimed! I remained speechless. It was too much…too good to be true. 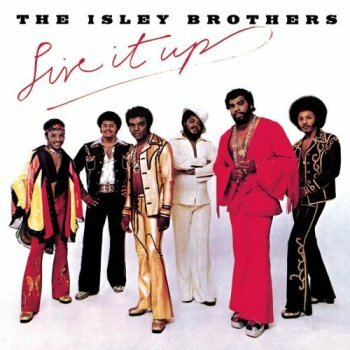 As Sensei Holloway called Sensei Kelly over, I could not help but notice and enjoy The Isley Brothers’ “Live it Up” jammin’ on the radio as he walked in to shake our hands, welcoming us to his school. “I look forward to working with you,” he said. I found him to be very personable, gracious and humble. Mom signed me up for one month of lessons which started the very next week – the first self-defense classes I would ever take. That moment, I felt like I was in a shining scene from one of Sensei Kelly’s action hero flicks…with The Isleys shoutin’ on the soundtrack. Sensei Kelly’s classes were very unique and highly distinct. I’ve practiced and studied many Martial Art disciplines over the years since but never lost my appreciation for those classes from the summer of `74. In hindsight, I realize that the Karate we were being taught was Sensei Kelly’s own hybrid method – an integration of some of the best of what he’d been exposed to and what he deemed most practical for application on the streets. A couple of blocks right down the street from our school was a “rival” school run by Sensei Steve Sanders-Muhammad, the founder of BKF: The Black Karate Foundation. It was an excellent school for other serious martial artists. The rivalry between the schools was intense and exemplary. It was beautiful… You just don’t see enough of this kind of rare combination of high competiveness and respect today. 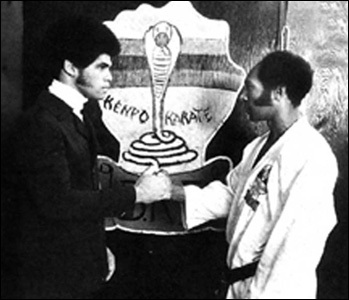 Sensei Sanders-Muhammad and Kelly were both first rank champions and they competed against each other in tournaments, yet these men would train together, learn from each other, and be like true brothers and support each other, even though their schools were mere blocks apart. Sensei Kelly even offered special courses in Kempo at his studio, which was the specialty of Sensei Sanders-Muhammad. The students from these schools sparred with each other fiercely and participated in tournaments together, but always maintained the tones of respect and honor as their teachers. What’s more amazing is that all of this experience was taking place at a time of great gang violence with sets like the Crips and the Brims wreaking a reign of terror all around this 2-block sanctuary. 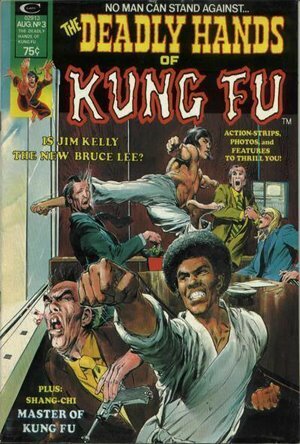 Well, as the summer of 1974 progressed, I was forced to discontinue my studies at Black Belt Jones. My mother could not afford it and I was very heart-broken, to say the least… I also had to give up my pursuit of playing the alto saxophone and sell my horn. As time went on, Mom tried to compensate by putting me in a Korean Hapkido school with my cousin David. I had a little fun there, but we mostly goofed off, which would never have been tolerated at Black Belt Jones. 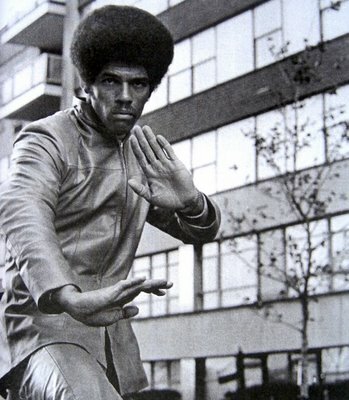 I was around Jim Kelly back in 1974 when he was as hot as any other Black actor in Hollywood – two years after he’d made his film debut in “Melinda” starring Calvin Lockhart who he trained in Karate in real life and who in turn helped him land a role in the picture. 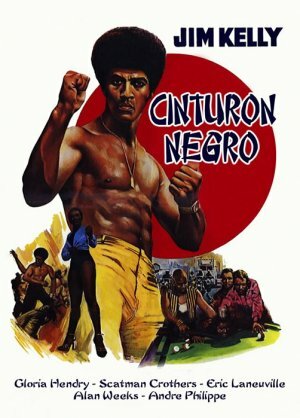 1974 was one year after he burst on the international stage as Bruce Lee’s co-star in “Enter the Dragon.” This is the year he followed that up by starring in his own Black Martial Arts classic, “Black Belt Jones” co-starring Scatman Crothers, Marla Gibbs, Gloria Hendry, Ted Lange and Eric Laneuville. The reasoning for this not being followed-up with a sequel featuring this cast I do not understand. Why this could not have been developed into a great television series also makes me wonder. 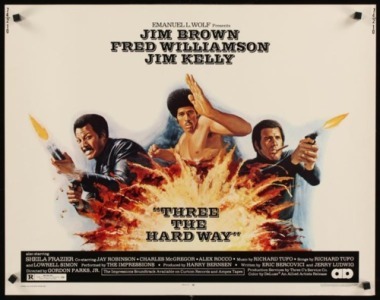 1974 was also the year that he teamed up with Black film action heroes Jim Brown and Fred Williamson in “Three the Hard Way,” and co-starred in his second Hollywood meets Asia production, “Golden Needles,” with Joe Don Baker, Elizabeth Ashley and Burgess Meredith. 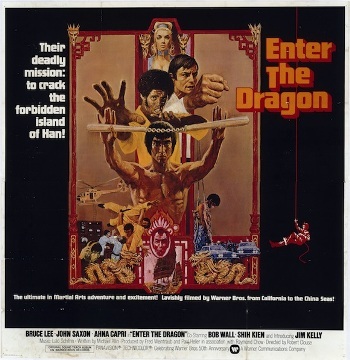 In 1974, Jim Kelly was “Warner Bros.’ Brutha” – the true and logical successor to Bruce Lee whose last words to him upon the completion of “Enter the Dragon” were a coveted invitation for him to come back to Hong Kong with him to make another film…one that would star just the two of them. In 1974, Jim Kelly understood ALL of this perfectly, training and preparing himself to be that successor…to be at that Bruce Lee level while also being his own unique self. It was a daunting challenge – just like it was for Bruce – but he embraced it. It was an unforgettable pleasure for me to actually observe him train, improve and perform jaw-dropping feats. Watching Sensei Kelly inspired me to push myself to a higher level of focus under the scrutiny of his no-nonsense brow. In short, Jim Kelly was the real deal. He wanted to be a light, positive inspiration and influence on people just like his heroes Muhammad Ali and Bruce Lee. It’s my honor and blessing to in some very small way bear witness that he was, is, and will continue to be just that. Jim Kelly with young student in the L.A.
Today, my 16 year-old son Tariq loves to wear his Hawaiian pooka shells because of Sensei Jim who wore them on-screen and off. 3 Responses to "An Inside Appreciation of Martial Arts Master Jim Kelly"
Thanks Eli. Sensei Kelly was a man of superior quality.